The mission of the American Industrial Hygiene Association (AIHA) is to protect all workers from occupational hazards. AIHA volunteer groups work with OSHA to identify and educate on common hazards within specific industries. For instance, the Laboratory Health and Safety Committee reviews lab safety incidents. They use the research from those to help improve industrial hygiene and safety in the industry. In one such incident, an electrical fault ignited a lab refrigerator and its contents. The fridge sat next to a flammable safety cabinet. Not only did it burn for a long time, the fire was also hot enough to melt an overhead light. This dripped onto the safety cabinet. Despite the intense heat and the melted plastic, the only signs of damage to the safety cabinet were scorch marks on its exterior. There were no signs of flames within the cabinet. Flammable storage safety cabinets protect their contents from fire. They also give people time to evacuate before the contents alight. Keep reading to learn some best practices for using flammable safety cabinets. Flammable safety cabinets are only one element in fire prevention. Eliminating ignition sources is vital, but also challenging. Facilities include many potential ignition sources. Electrical outlets or panel boards are a prime example. Locate your safety cabinets a safe distance away from these outlets (“Safe distance” varies based on the class of chemical and ventilation; see OSHA 29 CFR 1910.106(e)(7) for more detailed information). Hot work activities like cutting, grinding, and welding can also ignite flammable vapors. Do not perform these activities near a safety cabinet. Keep smoking areas away from flammable storage and usage. Regulations prohibit locating flammable safety cabinets in exit paths from a building. The reason is that a fire in or around the safety cabinet would prevent people from accessing the emergency escape routes, putting lives at risk. Avoid placing safety cabinets under stairways, especially if the stairs lead to an exit. Locate a safety cabinet where it will have the least potential to impact emergency evacuations. Choose the best model safety cabinet for your application. For example, under counter cabinets fit laboratory worktops. This is much safer than using a standard safety cabinet as a work surface. Slimline cabinets provide a smaller footprint for tight spaces. Use a large 90-gallon cabinet instead of stacking two cabinets on top of each other. For more storage capacity, mount piggyback cabinets on top of 30- and 45-gallon Sure-Grip® EX cabinets. Not every state or authority having jurisdiction (AHJ) requires self-closing doors for safety cabinets. But, we recommend using them because they provide “foolproof” protection in a fire. During normal daily operation, users often leave safety cabinet doors open as they remove and replace chemicals. But what happens if they forget to close the door and there is a fire? If the cabinet had manual close doors, the user wouldn’t be able to approach it. Even worse, the open doors render the safety cabinet useless and expose the flammable chemicals directly to flames. This creates a volatile environment. Flammable safety cabinets with self-closing doors have fusible links. These links melt when the temperature reaches 165 degrees F (74 degrees C). The doors then slam shut even if nobody can reach the cabinet. Find out more about self-closing doors here or check out this TechTALK. 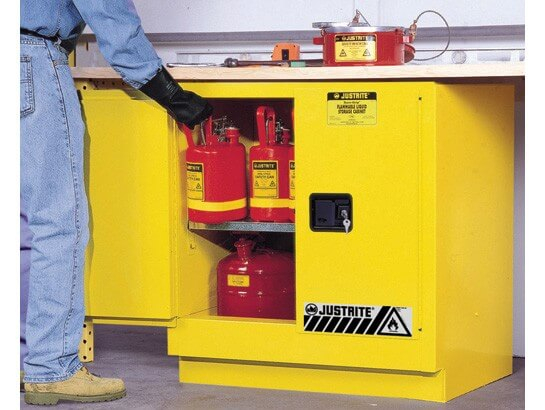 All Justrite flammable liquid safety cabinets come with exterior grounding lugs. But, grounding is not always required. Cabinets must only be grounded when dispensing Class 1 flammable liquids from a container within the safety cabinet. We also recommend grounding the cabinet when dispensing Class 2 combustible liquids, if the liquids are near, at, or above the liquid’s flashpoint temperature. Because static buildup can be dangerous, we support the industry best practice of grounding flammable liquid safety cabinets even when it is not specifically required. 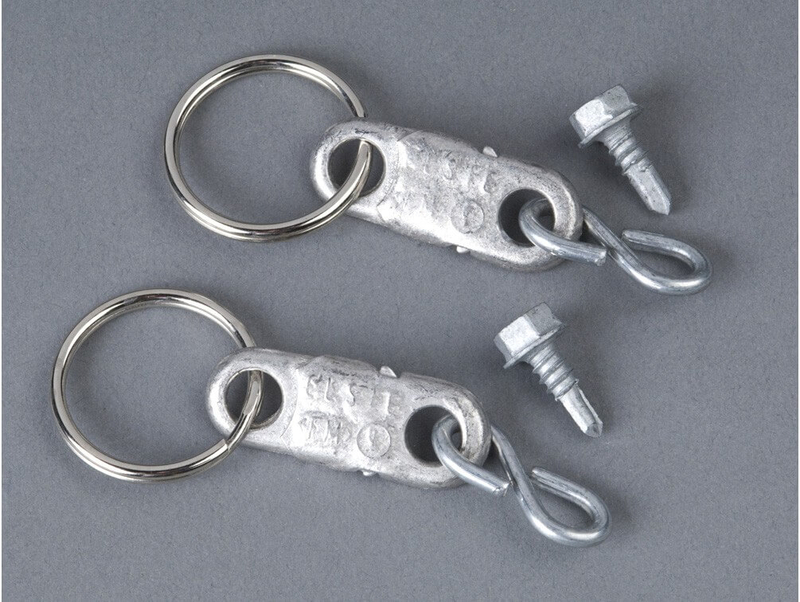 See our Guide to Safe Grounding and Bonding Practices for more information. For more than 100 years, Justrite has been a leader in the safety community. We partner with our customers to better understand, anticipate, and address the safety challenges they face every day. Our experts offer the advice you need to meet requirements and adopt overall best safety practices for your business. 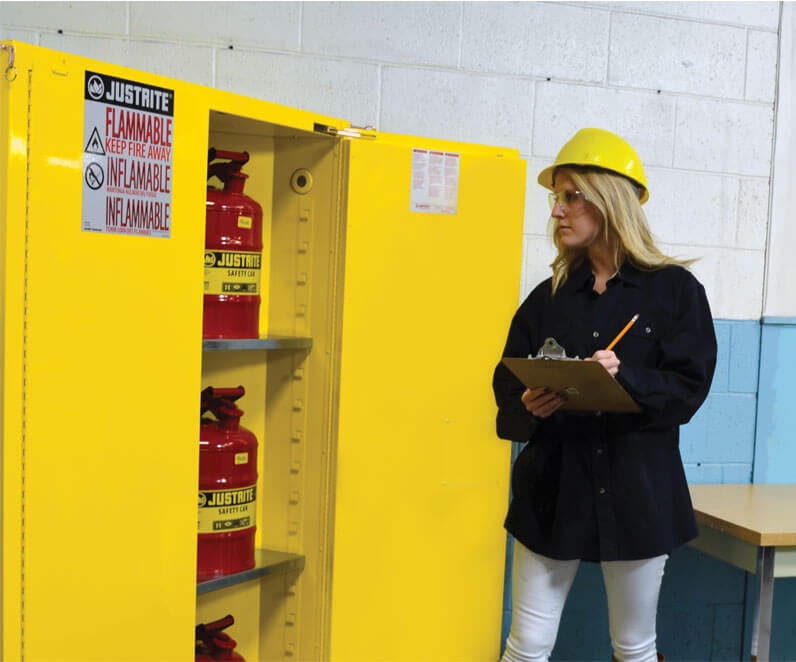 Justrite’s flammable safety cabinets carry FM Approvals giving you peace of mind about the safety of your facility. Find out more about flammable safety cabinets here or contact us for more expert advice.